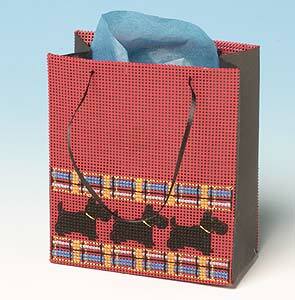 A row of Scotty dogs wearing gold collars walks across this smart red bag, decorated with bands of tartan. The inner bag is made from stiff black paper, to which the red embroidered perforated paper is attached, and has a blue tissue lining. The ribbons are black to match the bag which is about 12cms high.